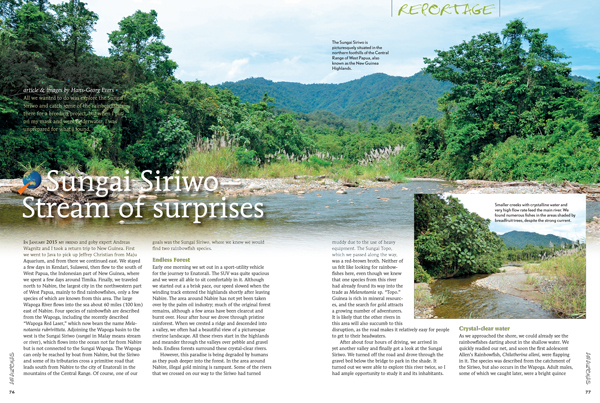 Preview of the cover of AMAZONAS Magazine, Volume 5, Number 1 and its Contents Page. Cover image by Matt Pedersen. 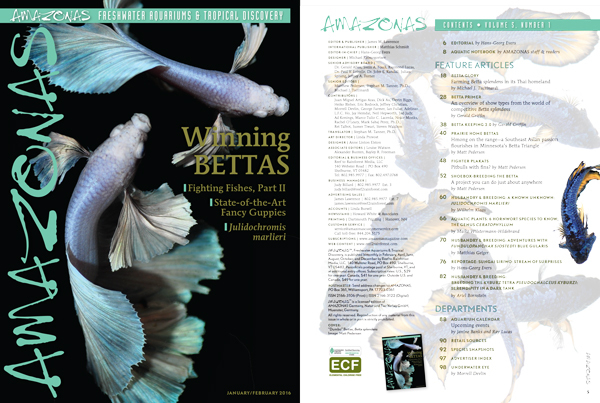 The January/February Issue of AMAZONAS Magazine is printed and now delivering to print magazine subscribers and local aquarium shops. Here is a sample of articles and opening pages for readers wondering what the issue will deliver. 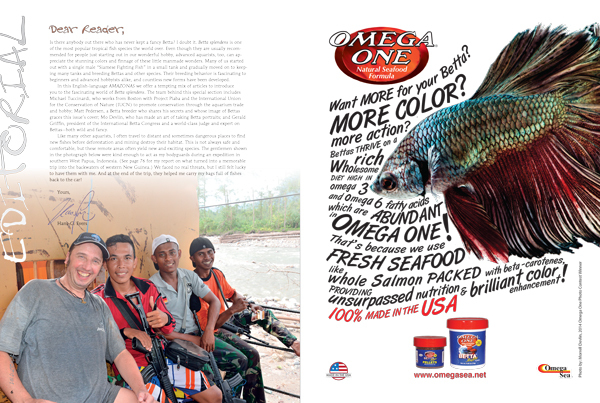 On sale date: December 8th, 2015 at the best tropical fish retail stores everywhere. 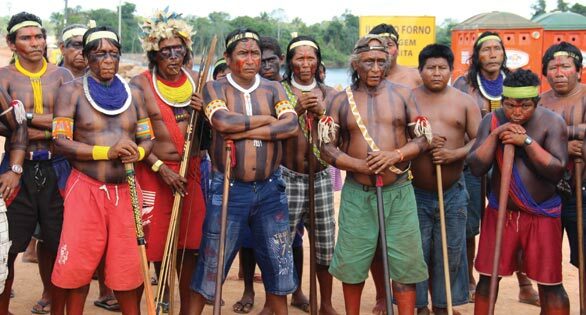 EDITORIAL: AMAZONAS Editor Hans-Georg Evers, left, with armed escorts assigned to protect him and his expedition while collecting fish in West Papua, Indonesia. 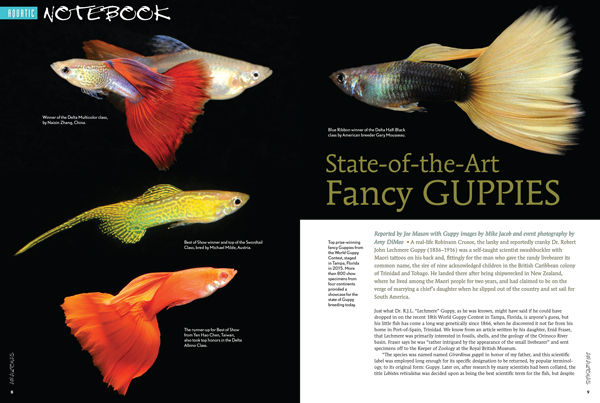 NOTEBOOK Aquarium News: Joe Mason reports on the World Guppy Contest for 2015, held in Tampa, Florida, and a place to judge the state of the Guppy Breeding arts today. 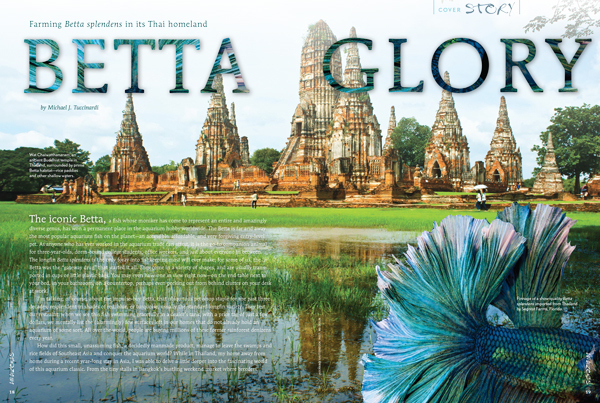 COVER FEATURE SECTION leads off by taking the reader to Thailand to visit the homeland of Betta splendens and a major source of farmed Fighting Fish for the world. Text and images by Michael J. Tuccinardi. What makes a good Betta? 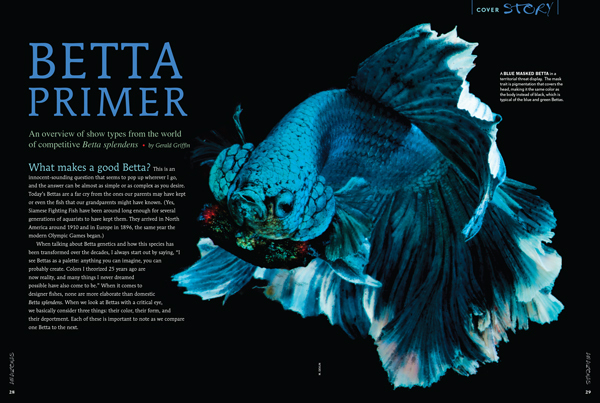 Gerald Griffin, President of the International Betta Congress and well-known show judge, describes all of the main forms of Betta splendens with stunning images by Morrell Devlin, Matt Pedersen and others. 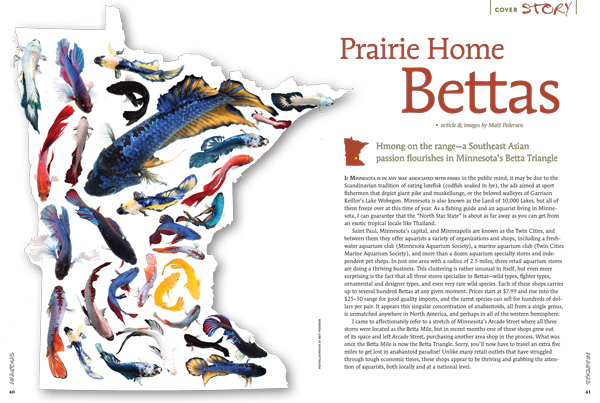 A hotbed of Betta keepers and breeders in the quintessential American midwestern state of Minnesota? AMAZONAS Senior Editor Matt Pedersen finds that wherever the Hmong people settle, Betta splendens is there with them and their ancient culture. Photo illustration by Matt Pedersen. 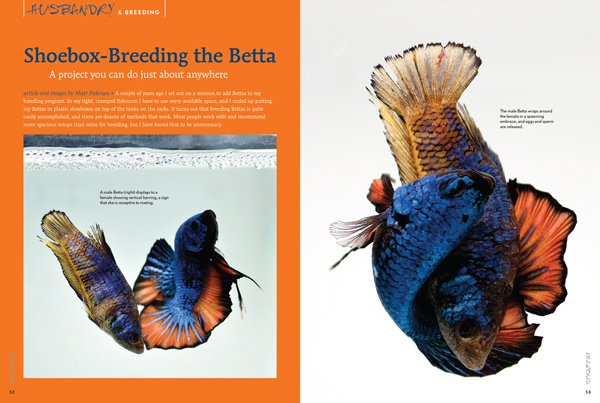 Able to thrive and reproduce in amazingly tight niches in nature, Betta splendens can be bred and reared in this amazingly compact system used by breeder Matt Pedersen. 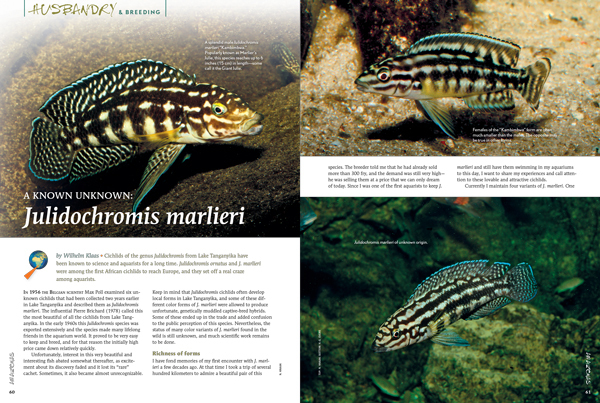 The Checkered Julie, also known as Marlier’s Julie, Julidochromis marlieri is a Lake Tanganyika native for fans of smaller, but not quite dwarf, cichlids. 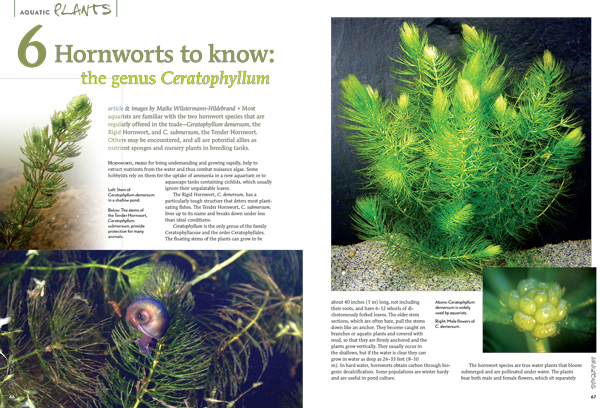 A bit too rampant in their growth habits to be ideal in planted aquaria, the Hornworts have their uses in new tanks, with foliage eaters and in breeding tanks. 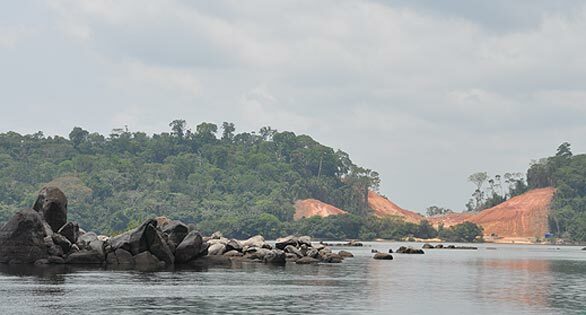 AMAZONAS founding editor Hans-Georg Evers takes off for the backwaters of West Papua, Indonesia, in search of new species and new adventures. 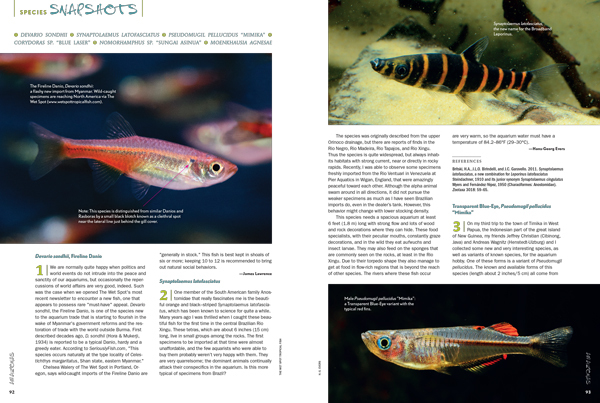 New and interesting livestock moving through the aquarium trade catches the attention of AMAZONAS editors. Get your personal subscription coming and don’t miss this big issue—just $29 per year.